Create a Beaded Art Doll by manipulating beads and forms into an imaginative tactile and visual 3-dimensional representation of this year’s theme: Transformations . I want to share, but can’t all at once. for whatever reason — fun, mundane or sinister — I’m not sure. The Fifth 2013 ALL DOLLED UP: BEADED ART DOLL COMPETITION is offering a first prize of a $1000.00 shopping spree on the Land of Odds web-site (www.landofodds.com), and a Runner-Up prize of a $400.00 shopping spree on the web-site. 1. INSIGHT: The Bead Artist’s inner awareness and powers of self-expression through sculptural beadwork, particularly in terms of how well this year’s Competition theme is incorporated into the piece. a. 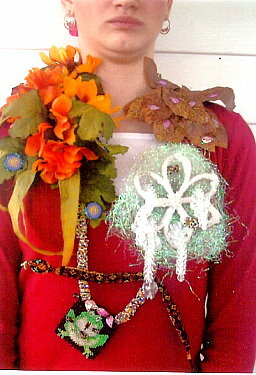 Primarily, how well a particular stitch or stitches (or any other technique for applying the beads and embellishing the doll) is (are) executed within and around the piece. b. Secondarily, how cleverly the internal structure/form/body of the doll has been created/constructed/chosen in relation to the artist’s goals. 3. 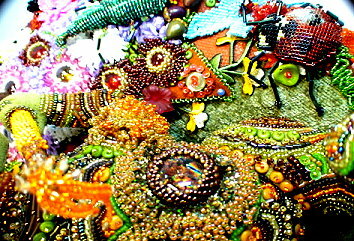 USE OF BEADS/BEADING AS ARTISTIC MEDIUM: To what extent the doll may be viewed as a work of “art”, rather than “craft”; has the artist fully utilized the power of the “bead/beading stitch” as a medium for art — an expression of color, light, tactile sense and emotion; to what degree does the piece make you want to view the doll from all sides? 4. VISUAL APPEAL: The overall visual appeal of the doll. 5. QUALITY OF WRITTEN STORY: How well the written short story enhances an appreciation of the Beaded Art Doll, as well as the Artist’s talents in design, insight and implementation. A Beaded Art Doll is a physical representation in three dimensions, using human figural and expressive characteristics, through the creative use and manipulation of beads. 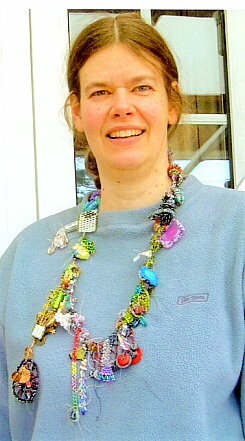 Beads are a unique art medium, allowing multidimensional surface treatment, and phenomenal opportunities for interplay among colors, light, shadow, texture and pattern. Beaded Art Dolls submitted as entries for this Competition should be immediately recognizable as a “Doll” as defined above. 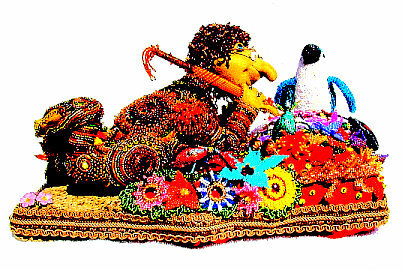 That said, Beaded Art Dolls submitted as entries for this competition may be realistic, surrealistic, whimsical or imaginary. They may be humanistic, animalistic, caricatures, cartoons, impressions or abstractions. 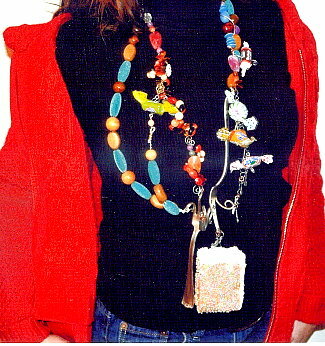 The doll may take many forms, including a figure, purse, box, vessel, puppet, marionette, or pop-up figure. Beaded Art Dolls should be between 8” and 36” in size. 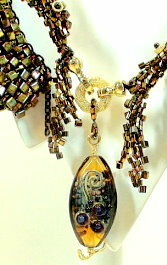 The surface area of the doll must be at least 80% composed of beads. The doll’s internal form and structure may result from many techniques, materials and strategies. The bead stitches themselves might be used to create the skeletal structure. Various forms of cloth dolls might be stitched or embellished with beads. The underlying structure might be made of polymer clay, wood, ceramic, porcelain, Styrofoam, wire, corn husk, gourd, basket weaving, yarns, cardboard, paper, cotton, or some combination of materials. It might be a found form or object. The Artist may include a doll stand or display support with the Art Doll, though this is not a requirement. This stand or support may be an off-the-shelf piece, or created from scratch by the Artist. It may be a base, a created setting, a decorative box, or frame. The stand or display support need not be beaded. 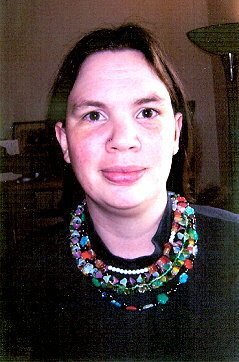 The Artist may interpret and apply the theme “Transformations” any way she or he chooses. The Beaded Art Doll might be thought of as a plaything; or as a visual representation of a person, feeling, spirit or thing; or as a tool for teaching; or as a method for stimulating emotional development or healing. As an object of art, the goal of the Doll should be to make a statement, evoking an emotional, cultural or social response, either by the Artist her/himself or by others. The Doll must be an original work, and may be the work of one Artist or a Collaboration. Dolls have been a part of human existence for many thousands of years. Whether part of a ritual or part of child’s play, dolls function as symbols for meaning. Sometimes these meanings are broad social and cultural references; other times, these meanings focus on an individual’s relationship with oneself. ALL DOLLED UP: BEADED ART DOLL COMPETITION is more than a beauty pageant. It is a design competition. The Competition will take into account the Artist’s intentions and how well these are incorporated into the design, both in terms of the use of beads/beading, as well as the construction of the doll’s form. 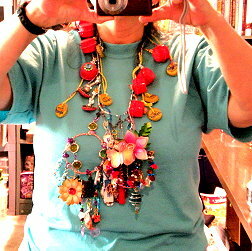 In early May, images of their necklaces will be posted online at Land of Odds. Along with these images, each contestant also had to submit a list of materials and write a poem. These too will be posted. Voting will begin at the end of May. Stay tuned for announcements. 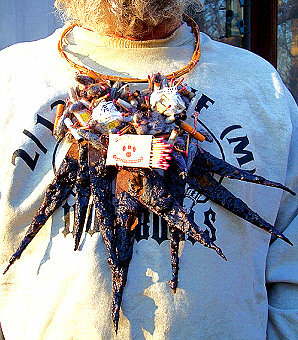 Entries for the 8th Annual The Ugly Necklace Contest 2010- A Jewelry Design Competition With A Twist – will be accepted beginning September 1, 2009. Deadline: March 15th, 2010.